by Kevin Daisey on February 20, 2018 . In today’s information-driven world, most people turn to an online search engine, like Google, to quickly find answers to questions or perform basic research. It usually works by typing a search term or phrase into Google and viewing the search results. But there is another, sometimes more convenient, way to get results from a search engine, and it’s called voice search. Voice search uses the power of speech recognition to search the web. Instead of typing a query, you can now use your voice input to quickly and easily get results from a search engine. You may have a basic idea of how SEO works, but voice search is making significant changes to the game. Especially for local companies, voice search can be an invaluable dynamic to pay attention to. Many large companies have made major investments in voice search technology, resulting in products called “intelligent assistants.” Consider products such as Amazon’s Alexa, Apple’s Siri, Microsoft’s Cortana, and Google’s Assistant. Google Voice Search, or Search by Voice, is a Google product that allows users to use Google Search by speaking on a mobile phone, computer, or smart home device. How many people are searching via voice search? One in six adults in the U.S. now owns a voice-activated smart speaker, which translates to about 40 million decision-making adults in the U.S. alone. A study by Verto Analytics in 2017 showed that 71 million people in the U.S. used their smartphone voice-activated assistants for search, which totaled nearly one billion hours each month. A survey revealed that most users of a voice-activated assistant said that they would not go on in life without one. 52% of people who own a voice-activated speaker say they keep their device in a common room, such as a family room, living room, etc. In the Google app, 20% of searches are now by voice. 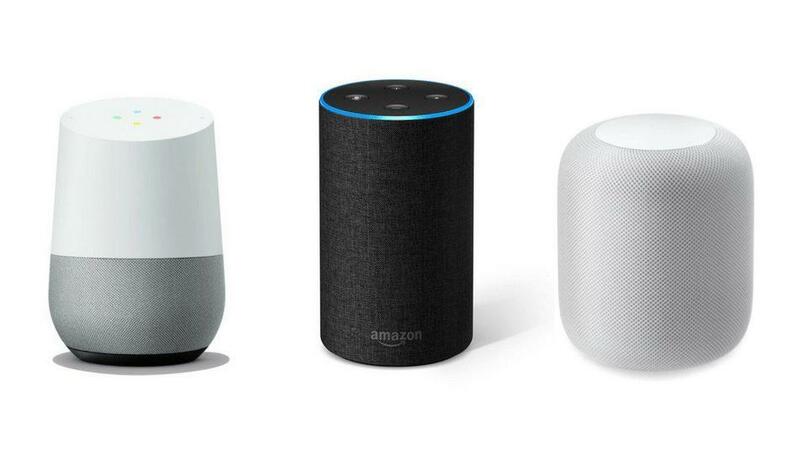 Based on studies, the rate of smart speaker adoption by consumers is outpacing that of smartphones. By 2020, at least 50% of all searches are expected to be done through images or speech! If you have already been using search engine optimization (SEO) best practices, you should be in good shape, but there are tactics you can use to improve your results with voice searches. If you are not using SEO best practices, you need to start making major changes to your website and its content. When users search by text, they tend to leave out trigger words like “the,” “top,” “best,” and “how.” Start including these words within your long-tail keywords to capitalize on voice searches that are more likely to use these terms. When a user performs a Google search, they might see a search result in a special featured snippet block at the top of the search results page. Google programmatically detects pages that quickly serve up the best answer to the user’s question, and displays a top result as a featured snippet in the search results. 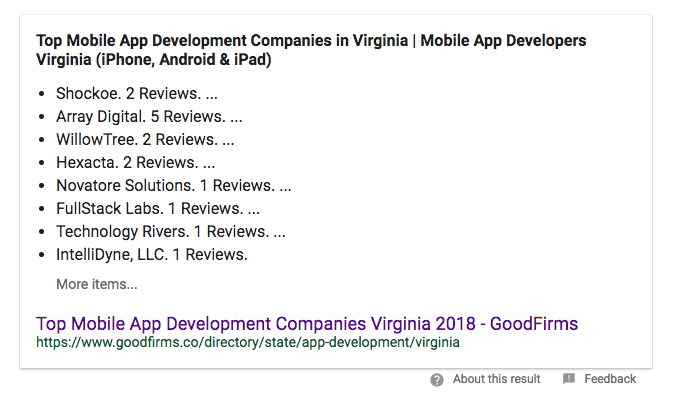 For example, if a user enters the search term “Top mobile app development companies in Virginia,” a Google Featured Snippet would look like this: This is not something that is easy to achieve, but multiple studies confirm that the majority of featured snippets are triggered by long-tail keywords. There is no doubt that voice search is becoming more popular, so the time to get your website on board is now. Google is even considering adding voice query data to the Google Search Console. This would allow you to gather more data and analytics related to your business and industry. Consult with your digital marketing team to make sure you are taking full advantage of this growing market, and start incorporating SEO strategies that will increase your chances of showing up in voice search results. By staying up-to-date with the latest and best SEO practices, you can help your prospects find you online, which raises your chance of converting them to lifelong customers. Having an SEO-responsive website can make a huge difference in how much traffic will find its way to your site. If you’re not too sure just how important an SEO-responsive site is, take a look at these benefits.